Ghosn is seeking new battery suppliers to reduce costs. PARIS (Reuters) -- Nissan may begin purchasing electric-vehicle batteries from LG Chem as it opens procurement to external suppliers in addition to its own manufacturing with NEC Corp., CEO Carlos Ghosn said. 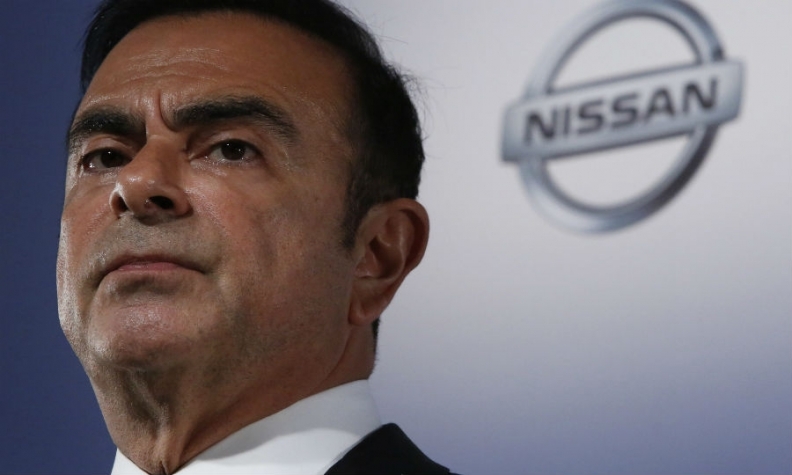 "We will have both, and I hope even more," Ghosn said on Monday when asked whether the Japanese carmaker would purchase from suppliers as well the NEC joint venture, AESC. Ghosn is preparing to cut in-house battery manufacturing, sources earlier told Reuters, while exploring a deal in which LG would produce power packs at existing Nissan production sites in the UK or the U.S.
Nissan's reversal on electric cars has reopened deep divisions with alliance partner Renault. The plan, which faces stiff resistance within Nissan, would see U.S. and British production phased out and a reduced output of next-generation batteries concentrated at its domestic plant, two alliance sources told Reuters. Nissan would follow Renault by taking cheaper batteries from LG for some future vehicles, including models made in China. "We set out to be a leader in battery manufacturing but it turned out to be less competitive than we'd wanted," said one executive on condition of anonymity. "We're still between six months and a year behind LG in price-performance terms." "Renault would clearly prefer to go further down the LG sourcing route, and the Nissan engineers would obviously prefer to stay in-house," another insider said. "The write-off costs are potentially huge." Renault-Nissan "remains 100 percent committed to its industry-leading electric vehicle program" and has no plans to write down battery investments, spokeswoman Rachel Konrad said. "We have not taken any decision whatsoever to modify battery sourcing allocation," Konrad said, adding that the alliance "does not confirm or deny procurement reviews." But Nissan is already negotiating with manufacturing partner NEC Corp. on the shift to dual sourcing, with Ghosn's backing, the sources said. Nissan currently makes all its own electric-car batteries. Under Ghosn, who heads both companies, Renault-Nissan bet more on electric cars than any mainstream competitor, pledging in 2009 to invest 4 billion euros ($5.2 billion) to build models including the Nissan Leaf compact and as many as 500,000 batteries per year to power them. Nissan and NEC invested 23 billion yen ($215 million) in their Zama, Japan, battery plant and electrode manufacturing, backed by government aid. U.S. and British taxpayers also helped with the $1 billion invested in Tennessee and 210 million pounds ($341 million) in Sunderland. But the mass consumer was largely unmoved -- or deterred by the sluggish rollout of recharging networks -- despite generous sales incentives in key markets. Global electric-car sales will remain shy of 1 million in 2020, according to forecaster IHS Automotive, less than one percent of the total vehicle market, and one-tenth of the demand Ghosn had predicted. "Renault-Nissan were definitely ahead of their time -- in a bad way," said Stuart Pearson, an Exane BNP analyst. "There's nothing wrong with ambition, but when that involves excess investment then it's also a risk," he said. "Their targets were really excessive on volume and battery capacity." The alliance has begun a belated push into faster-selling hybrids, combining electric and combustion-engine propulsion. Upscale electric rivals such as Tesla's Model S meanwhile hog the limelight, backed by big investments in newer, cheaper battery technologies. Ghosn dropped extra battery sites planned for both alliance carmakers, leaving Nissan with the entire production capacity of 220,000 power packs through the NEC joint venture, AESC. But that still far exceeds the 67,000 electric cars Renault-Nissan sold last year, and even the 176,000 registered to date. A pledge to reach 1.5 million by 2016 has been scrapped. The coming hybrids will fill some of the excess plant capacity, although they use fewer power cells per vehicle. An all-electric Tesla rival is still planned for Nissan's premium Infiniti brand in 2018 with batteries as big as 60 kWh, more than twice the energy capacity of the Leaf, which is due for replacement the previous year. Nissan is seeking to unwind a ruinous NEC contract that requires it to purchase electrodes for the full capacity of 220,000 Leaf-sized 24 kWh batteries regardless of actual sales, sources said. The joint venture partner's consent is also needed to bring LG production or other activities onto the Tennessee or Sunderland sites, which together employ 500 workers. The financial hit for Nissan "will depend on what else we can do with the plants", with heavy charges likely if both are closed, one manager added. Renault has already taken at least one writedown of 85 million euros on its over-investment in electric cars following the collapse of Better Place -- a charging startup that had ordered 100,000 of its battery-powered Fluence sedans. For Nissan, the plant cuts would be a partial retreat from the automotive battery market -- expected to top $20 billion by 2020 -- just as Tesla builds its $5 billion gigafactory with Panasonic in Nevada. Japanese engineers are still smarting from Renault's 2010 move to drop Nissan batteries and purchase LG for its flagship Zoe model, worsening the overcapacity problem. "It was a 15-20 percent cost gap," said one of the people involved in the Renault decision. "In purchasing, 3-4 percent is usually enough to choose a partner for." Today's Nissan batteries come in at $270 per kWh, based on replacement prices thought to be below cost, according to consulting firm AlixPartners. The true manufacturing cost is believed to be over $300, inflated by the amortization of unused plant capacity and the burdensome electrodes deal. The next generation will have lithium nickel manganese cobalt oxide cathodes, as used by LG, rather than the current lithium manganese oxide chemistry. The alliance cost target is $200/kWh, whether made or bought, sources said. With a clean slate and sufficient volume, Nissan engineers insist, their next generation of batteries could be competitive on price as well as keeping crucial know-how at the company. "When you're developing cutting-edge technology, the best way to know about that technology is to build it in-house," said one. "That's what Tesla is doing." Former Nissan second-in-command Carlos Tavares, racing to beat the Renault Zoe to market, cut Leaf development by a year and skipped a critical battery redesign, according to alliance veterans. Nissan later cut prices, settled a class action and offered retroactive warranties to answer customer concerns about battery deterioration. Tavares now heads PSA/Peugeot-Citroen. But the CEO's mind may be all but made up. "We're in the process of opening up battery sourcing to a range of suppliers," Ghosn said last week when asked whether Renault could buy batteries from France's Bollore. In future some batteries will likely be outsourced "within the framework of alliance procurement," he added. "What's important to us is that electric car performance fully meets customer expectations."